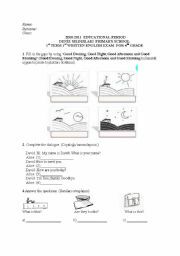 THIS EXAM IS PREPARED BY ME FOR 4TH GRADE STUDENTS IN PRIMARY SCHOOL. THE TEACHERS IN TURKEY CAN USE IT BECAUSE IT IS PREPARED ACCORDING TO SYLLABUS OF 2014-2015 EDUCATIONAL PERIOD. IT IS USED DIFFERENT KINDS OF ASSESSMENT INSTRUMENTS IN THIS EXAM. SO ASSESSMENT AND EVALUATION IS VERY TRUSTWORTHY. 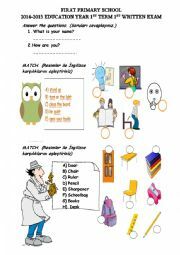 THIS EXAM IS PREPARED BY ME FOR 4TH GRADE STUDENTS IN PRIMARY SCHOOL. THE TEACHERS IN TURKEY CAN USE IT BECAUSE IT IS PREPARED ACCORDING TO SYLLABUS OF 2010-2011 EDUCATIONAL PERIOD. IT IS USED DIFFERENT KINDS OF ASSESSMENT INSTRUMENTS IN THIS EXAM. SO ASSESSMENT AND EVALUATION IS VERY TRUSTWORTHY. This is a quiz about prepositions of place, Countries, Can/ Can�t, Action Verbs. It is a ppt game about feelings. Your students will have so much fun with minions! 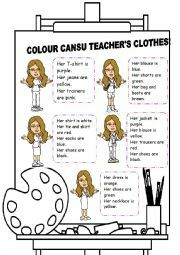 It is a powerpoint game as to practise Present Continuous Tense.